Something hot is cooking in this side of town… They are what you call 'big fishes' in the vast ocean of deep blues rock. And they're soon to hit these short and cause waves of excitement as they come and give this city a big jolt of electrifying American blues and roots music. 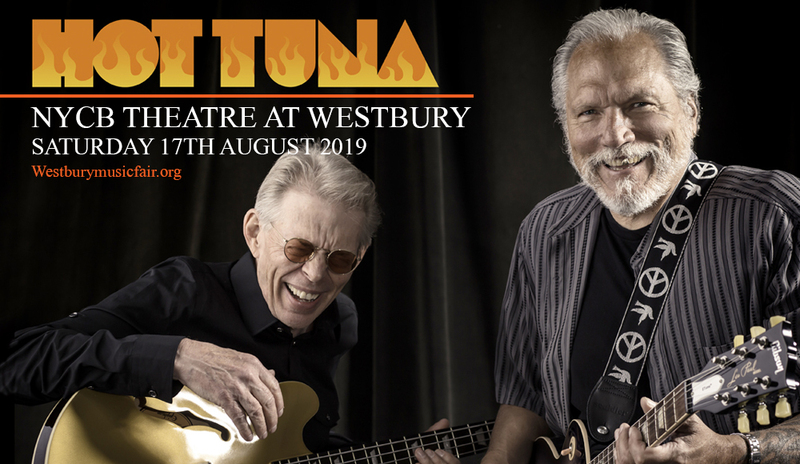 HOT TUNA ELECTRIC, the wildly entertaining blues masters, is bound to hit the center stage of the NYCB Theatre at Westbury on Saturday 17th August 2019. Multi-generations of fans have been hooked on their music, so better catch 'em while you can before tickets get sold out. No long queues or waiting. All it takes is one easy click on 'buy tickets'. Book those tickets now! The band name Jefferson Airplane evokes a degree of respect and regard for a band that helped define the modern rock sound. As the band took a much need hiatus in 1969, Jorma Kaukonen and Jack Casady took up the cudgels and carried with a new musical pursuit. From there, they founded Hot Tuna. They were back to square one; and as Jack says, “Scouting, always scouting, for places where we could play.” But real talent and virtuosity find its way into the radar of blues-rock aficionados. As crowds piled up and show venues got bigger, they were offered a record deal and not long afterward a tour. Thus their career now spans two-dozen albums, thousands of concerts around the world, and a fanbase that has not stopped growing even after all these years — and that's a whopping 50 years, to date. Hot Tuna has an impressive catalog which includes some of their most popular blues-rock hits like “Water Song,” “Hesitation Blues,” “Sea Child,” “Keep on Truckin',” “99 Year Blues,” “I See the Light,” “Death Don't Have No Mercy,” “Serpent of Dreams”, “Watch the North Wind Rise”, among others. Hot Tuna either plays acoustic or electric. This time, it's going to be an electrifying weekend that will blow you away. Get your tickets now!